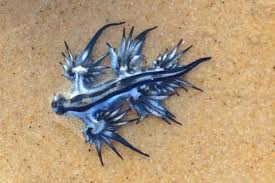 The sea slug is normally found in the tide of the beach on the ocean floor. 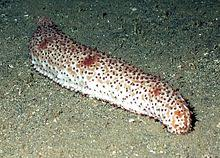 Or is often found in a coral reef. The sea slug lives in these places for food and camouflage from predators. The sea slug feeds on allege and plankton. The sea slug eats by a little hole on the bottom of its body even thought it is often found on the beaches, plankton often comes to the beach for a swim and the allege grows on jetties, rocks and metal. What does the sea slug look like? Most sea slugs look the same but the sea slug has some very unique features on its body these include: They come in any pattern, they have pteropods ,they have two layers and they are one of the only sea creatures in the ocean that carries its eggs on its back. 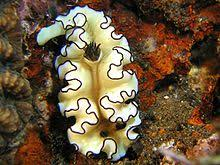 The sea slug moves by twisting its body because it only has two arms to push it self. Stage 1 the sea slug is in a egg in this stage the sea slug cannot eat but is still in the growing process. Stage 2 the sea slug emerges from its egg and starts feeding on plankton. Stage 3 the sea slug is now two years old and after six days of feeding it turns into a sea slug.